Will the Fed go to negative interest rates instead? If you have not yet read Part 1: Has The Fed Already Lost? available free to all readers, please click here to read it first. What If The Fed Isn't Actually Able To Raise Rates From Here? Let’s start with a look at the history of the Federal Funds rate (the shortest maturity interest rate the Fed directly controls). Alongside the historical rhythm of the Funds rate are official US recession periods in the shaded blue bars. Of course there is one striking and completely consistent historical commonality in the behavior of the Funds rate over time. 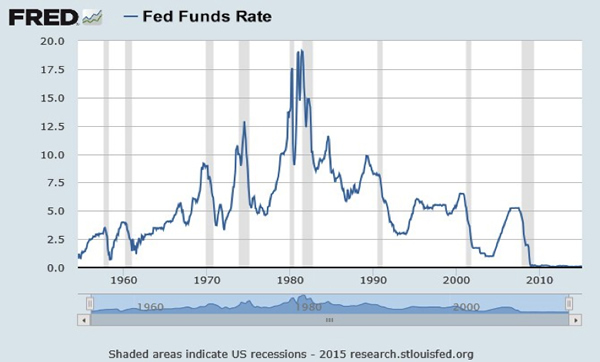 The Fed has lowered the Federal Funds rate in every recession since 1954 at least. There are no exceptions. You can see the punchline coming, can’t you? Just how does one lower interest rates from zero to stimulate a potential slowdown in the economy?